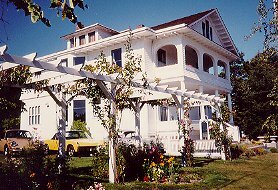 The Quimper Inn, built in 1888 and restyled in 1904, is perched in the uptown historical district of Port Townsend, (one of three National Historical Victorian Seaports). The Inn holds a mix of of turn-of-the-century antiques, personal collections and memorabilia. The large living room has comfortable seating around the fireplace and the second floor has a balcony from which you may catch a glimpse of a century old "Tall Ship" or the Nimitz on Port Townsend Bay. The downtown buildings date from the 1880's and house many unique shops, book stores, antiques and galleries. Restaurants feature northwest cuisine, as well as Thai, Mexican, Italian, Morrocan and Chinese. Rainfall is only 20 inches a year making Port Townsend the ideal year-round getaway. Nearby activities include 3 golf courses, kayaking, sailing, beach walking, cross country skiing, tennis and biking. 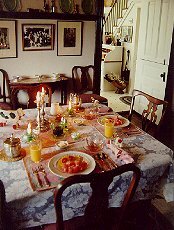 The Quimper Inn Bed and Breakfast has 5 guest rooms including a two-room suite. Three have private baths and all have views. A full breakfast is served. Rates: VISA/MC personal checks accepted - Deposit of first night's rate guarantees room, 7 days notice of cancellation required for full refund - non-smoking, adult establishment.